The cultivator said he now owes dues worth over Rs 35,000 to fertilisers and pesticides supplier. 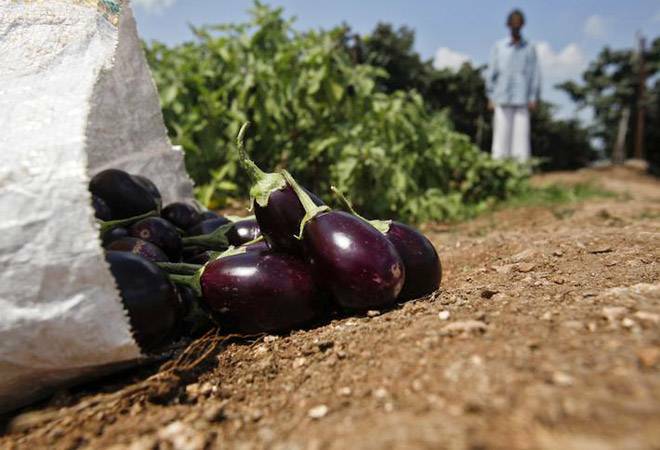 Driven to despair by being offered a meagre 20 paise per kilogram for his brinjal production, a farmer in Maharashtra destroyed the entire plantation on his land to save himself from incurring further losses. Rajendra Bawake, from Sakuri village in Rahata tehsil of Ahmednagar district, claimed he earned only Rs 65,000 after investing Rs 2 lakh and putting in all his energy to cultivate the brinjal crop. Frustrated with the low income, the distraught farmer uprooted all brinjal plants from his field and threw them away on Sunday. "I had planted brinjal on two acres of land and laid pipes for drip irrigation. I used fertilisers, pesticides and modern mulching techniques to enhance the production. The total investment came to around Rs 2 lakh. In return, I earned only Rs 65,000," Bawake told PTI on Monday. The cultivator said he now owes dues worth over Rs 35,000 to fertilisers and pesticides supplier. "I don't know how I am going to raise that money," he rued. Bawake claimed that when he tried to sell his produce at the wholesale markets in Nashik (Maharashtra) and Surat (Gujarat), he fetched merely 20 paise per kg. "This frustrated me, so I decided to destroy the entire plantation to save myself from further loss," he said. As a routine practice, the cultivator had been selling his produce in cartons on a weekly basis. "But I never got better returns in the last three-four months and so, I decided to do away with the plantation," he said. Bawake said he rears three cows at home and needs money to buy fodder for the cattle. "I had hopes from brinjal farming, but now I don't know how to take care of my cattle," he said. Notably, an onion-grower from Nashik district, who had to sell his produce for little over Re 1 per kg and fetched only Rs 1,064 for 750 kg of the vegetable, sent his earnings to the prime minister last month to mark his protest. Farmers from different parts of the country, including Andhra Pradesh, Gujarat, Madhya Pradesh, Maharashtra, Tamil Nadu, West Bengal and Uttar Pradesh, had converged in New Delhi last Thursday in protest to press for their various demands, including debt relief and remunerative prices for their produce. Several Social activists and political leaders had slammed the Union government on Friday, alleging it did not implement a "single major initiative" for farmers in the past four-and-a-half years and that demonetisation "worsened the agrarian distress" in the country.